The village of Champagny-en-Vanoise is a beautiful and traditional village in the Savoie department of the French Alps. Unlike many Alpine resorts, this is a real village rather than a purpose built resort, and it prides itself on its heritage and history. That said, however, the skiing on offer here is certainly in no way inferior to that available in the newer resorts, and skiers who are based in Champagny-en-Vanoise have access to some of the best ski slopes in the Savoie. The atmosphere in Champagny-en-Vanoise is tranquil and friendly. The village is a great place for families and for those who prefer their après-ski to be spent in cosy bars and restaurants rather than living it up in nightclubs and casinos. The village boasts a small but select bunch of restaurants, and it is highly recommended that you try these to sample the traditional and delicious Savoie cuisine. The excellent range of small shops is open all year round, and is particularly renowned for local produce and crafts. The winters in Champagny-en-Vanoise are as beautiful and snow-filled as any in the Alps, and given the fact that the countryside around the village is registered as of exceptional natural importance, perhaps it is even more beautiful than most! In winter, the village looks as though it is straight from the front of a Christmas card, with snow-laden pines and pretty traditional houses and farmsteads. All levels of skiers are catered for here, with runs to suit everyone from wobbling beginners to the daring advanced! Ski schools will be on hand to help, and children too can have lessons and enjoy the slopes in safety. For the young and trendy, snowboarding is often the sport of choice, and the resort has a snow park for those whose idea of fun extends to "grinding the rails" and other surfing style acrobatics! 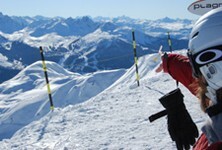 ** For further first hand information on skiing here, see the "your comments" section at the end of the guide **. Champagny-en-Vanoise is more than just a ski resort, and if you choose to spend some time here in summer you will find out exactly why this is the case. The village is surrounded by beautiful countryside which bursts into colour in summertime, with the song of the mountain birds and the fragrance of the Alpine flowers providing an idyllic backdrop. Sporty types will finds as much to do in summer as in winter, with possibilities including swimming, fishing, walking, cycling, horse-trekking and white water rafting. The hot summer sun beats down and illuminates everything, yet without the sometimes stifling heat which can be found at lower altitudes. Alpine properties close to good ski areas tend to come at a premium price, and Champagny-en-Vanoise is not the cheapest place in France for property seekers. It is, however, a better bet than some of the more glitzy resorts where you pay as much for the chance of bumping into the rich and famous as you do for the property or quality of the skiing! The authentic village atmosphere is very appealing to many, so if you do find a property here that you like the look of, don't hang around too long before making your decision. 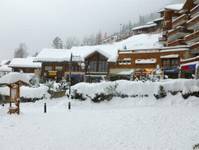 Champagny en Vanoise is easy to drive to at approximately nine hours from the tunnel and as the village is at 1250m, there are only two hairpin bends to negotiate which reduces the car sickness level. From Moutiers fifteen minutes away it is autoroute/expressway right up to Calais. The extent of the skiing is fantastic: Champagny en Vanoise has some good slopes, then you add on the rest of La Plagne, then you add on Les Arcs via the Vanoise Express and if that's not enough you drive twenty minutes to La Tania for Courchevel and the Three Valleys. We have owned a flat there for the last twenty two years. The last photo above is from high above Champagny en Vanoise on a long blue/red that comes all the way back to the village - the slopes in the distance are of Courchevel. Do you know Champagny-en-Vanoise better than we do? Do you have photos of Champagny-en-Vanoise? Champagny-en-Vanoise is located in the French Alps, in eastern France in the east of the Savoie department. Access: By air: Fly to Lyon St Exupery airport. By rail: There is a train station at nearby Moûtiers. Economy: The economy revolves around tourism, skiing and agriculture. Interesting fact: The countryside around Champagny-en-Vanoise is so unspoiled and beautiful that it has been classified as important in the National Monuments of France register.